The Node Zero Gallery opening on March 13th went great! 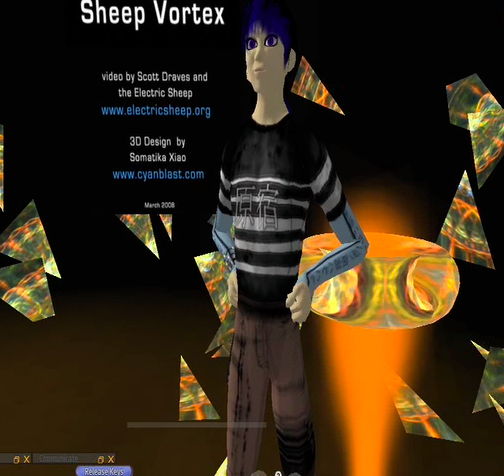 "Sheep Vortex" is an interactive art installation created by Spot and artist/SL programmer Somatika Xao. Here's a little video I made of the night's events. Music by Nine Inch Nails under the Creative Commons Attribution Non-Commercial Share Alike license that the whole album is released under! Spot said he was "pleased and gratified by the experience." Here's another installment from my interview with him (below). Lisa: What's going on when that happens? Spot: Well, it's doing interpolation in this genetic space, and it uses cubic splines, so that everything stays smooth. The reason it gets maybe fuzzy or wispy is that it's kind of like noise or dissonence, kind of, in music. It's like, when everything is out of tune. It's like, highly structured geometry - like triangles and squares with sharp, straight lines - would be the equivalent of like pure tones, like sin waves, or a flute. You know, the visual equivalent of a flute sound in the metphor I'm trying to give - a line or a curve or a circle. Lisa: So is that during the interpolation phase, because it's trying to figure out what it's doing? Spot: Yeah because to go from one harmony to another harmony you have to go through chaos and disharmony, because you're going from one domain of organization to another domain of organization, and in between, you're disorganized. So that's the principle. 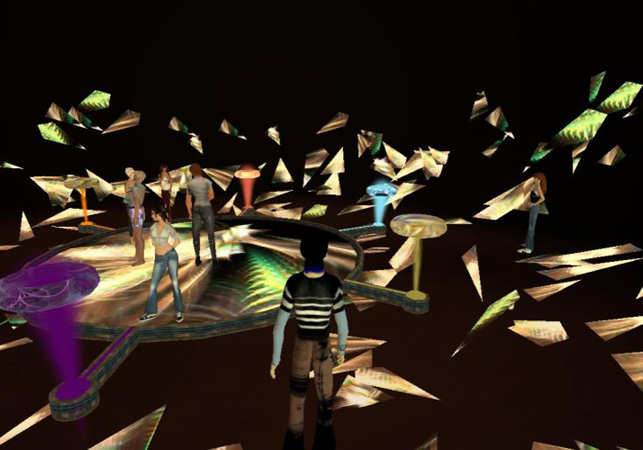 Lisa: This metaphor of virtual worlds in virtual worlds is one that comes up a lot lately. Are you saying that when somebody votes on a picture, that that information is stored somehow in this format, and then tallied up? Is that how that works? I'm trying to understand what information is expressed in the XML. 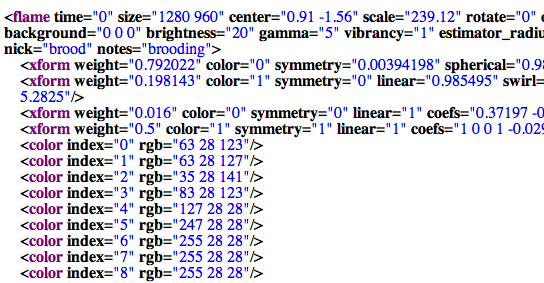 Spot: The XML controls the shapes, and the colors, and the motions. The votes don't get stored in there. The votes get transmitted to the server, and tallied up. Lisa: The shapes -- like the way a vector-based format, like SVG (Scalable Vector Graphics) works? Spot: Nope. Are you asking about the renderer and the way the visual language works? Spot: It's based on...what you're sort of seeing is the interference pattern between geometric transformations of the plane. So, you can imagine like, one map of the plane to a plane might be something like "rotation," ok. That's one transformation of a plane. Another transformation of the plane is like "scale," "rotate" and "translate," are the three basic linear ones. But there's also, non-linear transformations, like you know, you can imagine "bending" or "warping" the plane. So there are a zillion transformations of the plane. Lisa: So that's what is expressed? Spot: Yes. The XML is a list of transformations of the plane. And then, what the renderer does -- See, in order to actually turn the genetic code, the "genotype," into the "phenotype," you actually have to solve the equation. Just like, the only way to find out who a child is going to turn into, you have to let them grow up. It takes time, right. So, in order to draw the image, you have to do all these iterations, and so you generate billions of particles that move according to the transformations, and then the "interference"-- what you see as the particles move - the results make the pictures. 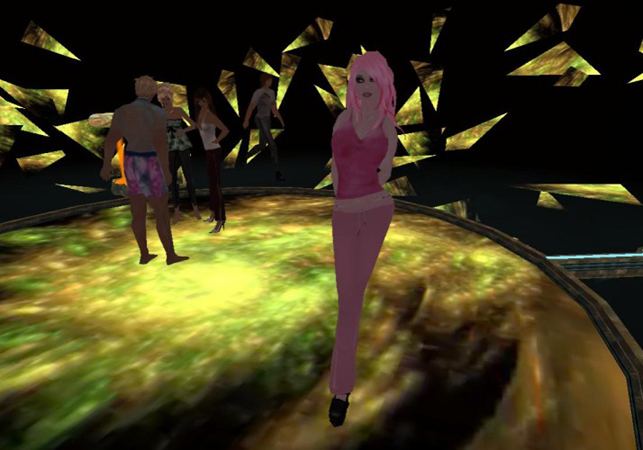 Lisa: So, particle systems are another thing that you hear a lot about in Second Life. Spot: Right. This is like a custom particle system. One that generates so many particles, that everything you see, when you see a line here, it's not a line, it's particles that happened to have combined and ganged up to form a line. And so these particles are like intelligent dust, can reconfigure themselves into any of the shapes that you see, just by changing the rules that they're all following.